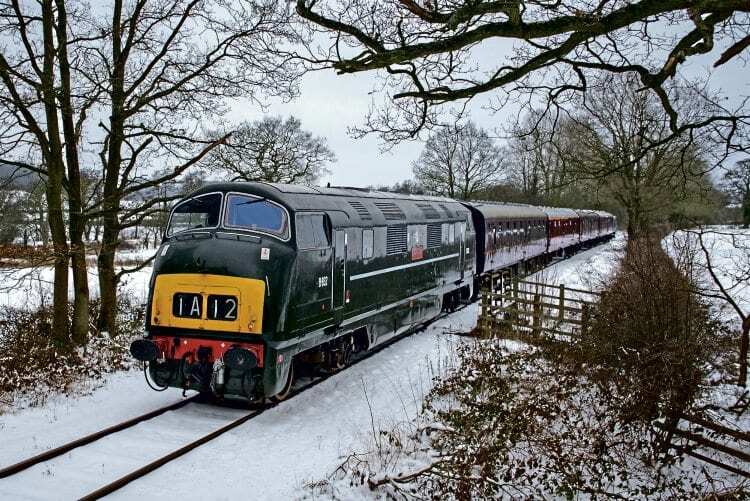 SNOW covered much of the country over the weekend of March 17-18, coinciding with three major diesel galas at Chinnor & Princes Risborough Railway, Oxfordshire; Ecclesbourne Valley Railway, Derbyshire; and the Mid-Norfolk Railway. Despite freezing conditions all three were able to provide a good service thanks to the dedication of railway staff and volunteers, with their efforts rewarded by good attendance. Full credit must be given to the Ecclesbourne Valley Railway staff for keeping the timetable to minimum disruption during some pretty brutal conditions. Star of the show was Class 42 ‘Warship’ No. D832 Onslaught, visiting from the East Lancashire Railway for a couple of weeks. This was in place of the originally advertised ‘Hymek’ No. D7076 (RM March p6), which it is hoped will appear at the EVR’s August 11-12 diesel gala. Read more News and Features in the April issue of The RM – on sale now!